* Note on September 8/14: Another round of DGR hearings! 10 days, starting Sept.9th. Find all the info you need - schedule, location, how to access live Webcast, here. Good afternoon, members of the Joint Review Panel, OPG and CNSC staff, fellow intervenors, members of the public and those who are watching the proceedings via Webcast. My name is Janet McNeill, and I’m here today representing the group Durham Nuclear Awareness, or DNA for short. As explained in our written submission, we are a group of concerned citizens who volunteer our time and energy to raise public awareness of nuclear issues in the Regional Municipality of Durham. We have a steering committee – this is where I’m going off-script to answer the specific questions that you [Panel Chair Stella Swanson] have asked. We have a steering committee of eight people who meet regularly to host public events, attend Durham Nuclear Health Committee meetings, contact politicians, and so on. I’d like to say we have a huge membership – documented membership, and the fact is we’re not sophisticated enough to have the – what would you say, the infrastructure to create that sort of thing. We’re all volunteers. We don’t have the time to pursue doing newsletters, pursuing a whole bunch of members, taking in memberships, and so on. I’m going to say something a little more about the history of the group below that was already in my remarks. We’re from the area east of Toronto that is host to not one, but two gigantic nuclear generating stations. We have neighbours, friends and acquaintances who work for the nuclear industry, and like them we live with crossed fingers, essentially, in the hope that Durham Region will never be host to a nuclear disaster like Three Mile Island, Chernobyl, or Fukushima. The DNA group, in fact, originally came together after the Chernobyl nuclear accident that took place on April 26th, 1986. While I was not an active member of the group in its earlier incarnation, I’m aware of the group’s impressive work and achievements under the leadership of Irene Kock and Dave Martin, two activists whose efforts continue to bear a huge impact on the nuclear awareness that our group’s name speaks to. These activists won widespread respect for their technical understanding, tireless activism and educational efforts. It’s an honour to continue the work of the DNA group that they gave birth to. The DNA group’s name indicates right up front that our concerns are not just about those of us alive today, but also all future generations whose lives stand to be unavoidably affected by the heavy burden this industry has placed on every single human being and every living thing on the planet. The group had a dormant period and then came together once again after the Fukushima nuclear disaster that began on March 11th, 2011. We’ve intervened recently at the Darlington refurbishment hearing in December 2012, and then a few months ago in May at the Pickering re-licensing hearing. I myself have taken part in a number of CNSC hearings over the past three & a half years. However, I think it was not until I attended a nuclear waste conference in 2011 (six months into the Fukushima disaster) that I really began to grasp the true gravity of the crisis the human race now faces with the 5 or 6 decades’ worth of nuclear wastes that are building up at reactor sites around the globe. I’m going to share with you a number of things I learned at that conference, since they are quite relevant to the project under discussion here. Just before I do, I want to reiterate that DNA is a group of volunteers. None of us is an “expert.” None of us receives any financial remuneration whatsoever for the work we do. Our work is done on our own time, on our own dime, in the “spare” time we might otherwise use to watch TV, or do whatever it is that people who are not volunteers spend their spare time doing. So. First I will share with you some interesting things that came out of my attendance at a nuclear waste conference held 2 years ago now, then I’ll comment on the DGR project in a general way, & finally, I’ll provide a list of 10 reasons why DNA feels this project cannot possibly be permitted to move forward. So the Nuclear Waste Conference, September 2011. This was an industry conference on “waste management, decommissioning, and environmental restoration for Canada’s nuclear activities.” It was not a conference organized by and for activists, but a conference of nuclear industry people, hundreds of them from all over, gathered in Toronto from September 11th to 14th, 2011, exactly, as it turned out, exactly six months into the ongoing Fukushima disaster. Now, I’ve mentioned that until I attended this conference, I really didn’t begin to grasp the deep seriousness of the nuclear waste problem we now face on Planet Earth. It is also true that 6 months earlier, in March-April 2011 – when the Fukushima nuclear disaster was in its earliest days – I had attended many days of the Joint Review Panel hearing into the Darlington New Build project. In preparing my remarks for this hearing, I looked over the notes I took at the New Build hearing, & was reminded of my reaction at hearing OPG staff reveal how little is apparently really understood about how to safely & securely store nuclear waste for the really long-range periods of time it needs to be safely & securely stored. “We are looking into containers,” allowed one OPG staffer at the Darlington New Build hearing. I have to tell you that I was genuinely shocked at what I was hearing. Horrified, actually. But back to the nuclear waste conference & some things I heard while I was there. Things I Heard at the Nuke Waste Conf. Frank Doyle, President of the Canadian Nuclear Society, allowed right in his introductory remarks that Canada has “significant nuclear legacy liabilities” – a nuanced way for a nuclear industry person to admit that there is quite a bit of nuclear waste to deal with in Canada. In a workshop entitled “New CSA Guideline for the Exemption or Clearance from Regulatory Control of Materials that Contain, or Potentially Contain, Nuclear Substances," CSA or AECL spokesperson (I am still confused as to which), M. Rhodes spoke in a manner that was extremely dense in jargon & acronyms, & very hard to follow, about new regulation N292.5, this “Guideline for the exemption or clearance from regulatory control of materials that contain, or potentially contain, nuclear substances.” The phrases “abandonment” & “unconditional clearance” were used. And since, as I have mentioned, I found Mr. Rhodes difficult to follow, I can’t say a great deal more about his workshop. But the words “abandonment” and “unconditional clearance” raised some red flags in my mind. Ah. Public consultation, hmmmm? Only thing missing? The public. I was flabbergasted to hear speakers from the nuclear industry say with straight faces that they are “leaving an honorable legacy” in Port Hope. An honourable legacy. This was said more than once. It was confirmed for me that the way nuclear waste is categorized is pretty much arbitrary, and in any case, that the categories are created by the nuclear industry for its own convenience. Most members of the public are almost certainly not aware, for example, that low level does not mean low risk. 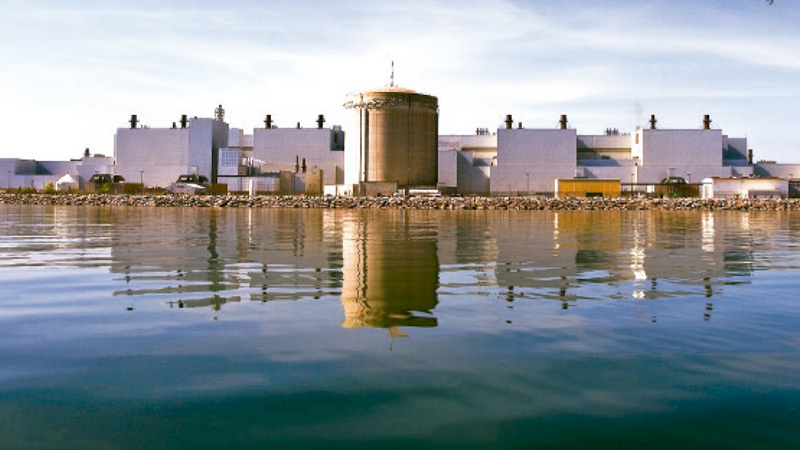 That decommissioning nuclear reactors costs simply shocking amounts of money – & not only that, is far from being a well-understood phenomenon or set of practices even within the industry. Charles Hickman from Point Lepreau in New Brunswick conveyed the information that Canadian nuclear waste is being sent to Tennessee for incineration there – because there was just a great deal more of it than anyone had anticipated, during the refurbishment project, & that they needed to get rid of it. Incineration of nuclear waste. This was something I was blissfully unaware of, before the conference. In other words, what I was learning was that we cannot count on the so-called “experts” to predict the quantities of nuclear waste involved in refurbishments & decommissioning, nor what is to be done to “handle” or “dispose” of them safely & properly. Yes indeed. Public confidence is very low, & it is ever waning. In the face of the ongoing disaster at Fukushima & the almost-daily shocking revelations there (still), it is quite safe to say that trust in the nuclear industry has reached historic lows. I noted down quite a few memorable quotations that I would like to share with you, as they too are quite revealing in a variety of ways. I should perhaps remind you that this conference was industry talking to industry. The level of candour was considerably greater than would likely have been the case had it been industry talking to the public, or industry talking to activists, or to journalists. Mark Corey – who was then (and may still be; I’m not sure) – Assistant Deputy Minister for the Energy Sector, Natural Resources Canada, shared his palpable excitement about Canada’s great fortune to possess the tar sands, & referred to the need for nuclear energy as a “crucial part of our energy mix” … but admitted that in a few areas of the country (e.g. Bancroft, Ontario & the northern route that uranium followed to get to Port Hope, Ontario) some “things” had been found that hadn’t been quite expected. He was referring to nuclear waste. CNSC President & CEO Michael Binder commented that “the March 11th event in Japan was a wake-up call,” and made the claim “We are not going to tax future generations” (with nuclear activities or waste). Another remark that took me greatly by surprise, since I didn’t detect any sign of an effort to phase out nuclear power – the only possible solution that exists for putting an end to the production of long-lived nuclear wastes! I was struck by his use of the word “we.” The CNSC lays claim to being an “arm’s length” regulator, & always vigorously denies being “embedded” in the industry. I would suggest to you that with this remark at the conference, Dr. Binder firmly established CNSC as an integral arm of the nuclear industry. He also downplayed the impact of nuclear waste, while at the same time emphasizing that the DGR planned for low & intermediate-level waste would be REALLY deep. “This stuff isn’t dangerous,” he seemed to be saying – but we’re going to bury it REALLY deep…. I should also mention that he pointed out that, with refurbishments, quantities of nuclear waste on the planet are growing. Something he seemed to be suggesting ought to be viewed as an economic opportunity. NASA staffer Keith Peecook described the $230 million project to decommission the Plum Brook Reactor Facility in Ohio. He was candid about a number of things. He was candid about something called “blending” (the more you “blend” nuclear waste, the less you have to send to a specially engineered waste facility; “blending” is being examined by the Nuclear Regulatory Commission, presumably so as to enhance this tactic for the future). He was candid in his comment that the public advisory committee in that Ontario – oh, pardon me – Ohio community, was undoubtedly more receptive to industry activities & staff, uh, explanations, than might be the case in a California one. When asked how much it had cost to build the reactor that cost $250 million & 1.68 million “man-hours” to decommission same, he replied “$5 million.” $5 million to build, $250 million to decommission. This was bracing information … & very informative. Of course many of us would suggest that ending the use of nuclear energy would be an excellent and the most effective (and only) way to prevent any further creation of radioactive waste!? Pauline Witzke of the Nuclear Waste Management Division, OPG, spoke about the DGR plans. She said that it is necessary to find a long-term solution for the waste that already exists – a solution, she added, that is "acceptable to the community." She acknowledged that “Transportation risk is quite high.” This was a – I thought an interesting thing to hear somebody from the nuclear industry admit. You won’t often hear that being admitted. Okay. And it’s important to note finally that I was not able to attend all the sessions at the conference that I would have liked to attend, because there were tons of things going on. Certainly some important themes emerged. I’ve summarized, I guess, 10 things that I learned at the conference. 1. The nuclear industry isn’t quite as “expert” as they would have us all believe. 2. There are now daunting quantities of nuclear waste all over the planet. “Regular” citizens would be shocked to know how much & in how many different locations in Canada, for starters, & all over the world. Not always handled responsibly, I might add, of course, was something I learned at that conference. 3. Phrases like “waste characterization” & “blending” & “legacy liabilities” & “historic wastes” & “Integrated Waste Planning” are used to cover up a lot of reality that is what can reasonably be termed seriously dangerous reality. 4. Refurbishments & decommissioning create very, very significant quantities of waste; so significant that sometimes here in Canada, we ship our waste to the U.S. for burning … & then receive back the ash. One can just imagine how toxic that ash must be if the folks in Tennessee don’t want to keep it down there where they are doing the burning. 5. There are very significant amounts of money to be made in the nuclear industry. One might almost say “staggering” amounts of money. And of course the industry experts & the regulator all have a piece of that large pie. 6. It is the Canadian public that is on the hook for so-called “legacy” or “historic” wastes at Chalk River & Port Hope, & also all the waste at Darlington, Pickering & the Bruce. Taxpayers are left responsible for the waste that is created by the nuclear industry – the industry that is profiting hugely from its activities. 7. We need not count on the industry to own up to its leaks and spills and disasters and explosions and emissions. It seems we must continue to count on members of the public to ferret out this kind of information. I could say quite a great deal more on this topic, but time does not permit… 8. We cannot count on the nuclear industry or our government to protect us from dangerous radioactivity or nuclear waste, because regulations about these things are discussed & changed behind closed doors on occasions that we, the public, are neither invited to, nor welcome at. 9. Conclusions about the Fukushima accident had not yet been reached, it was then still so new. Later on, the word “collusion” became part of the necessary vocabulary in discussions about the Fukushima disaster. At this conference in the fall of 2011, it seemed to me that very strong indicators were given of a surprising amount of cooperation among the industry, the federal government and Canada’s so-called regulator. 10. By the end of the conference I felt genuinely sickened. I honestly did. I’m not exaggerating. I felt sickened by the deep gravity & intractability of the issues surrounding nuclear waste. I concluded that all nuclear energy facilities need to be shut down immediately. And that all of the industry’s very considerable resources need to be directed from here on in to responsible decommissioning of all nuclear facilities everywhere, including, of course, the safe & responsible handling of the very considerable quantities of waste that already exist … never mind making any more. Okay. The DGR project. We said quite a bit about this in our written submission. A great deal of money has been spent & a great many studies have been undertaken to justify this project – which some have come to think of as the DUD – Deep Underground Dump. One sometimes wonders if people in the nuclear industry believe that simply generating 1000’s of pages in voluminous reports & so-called “studies” can take the place of rigorous study & testing of hypotheses. One wonders whether the people who carry out such studies such as these really believe that computer modelling can ever accurately reflect the deep complexities of ecological reality, which of course encompasses human reality. We are deeply part of ecological reality. Now, I am always happy to confess right upfront that I am not personally a “technical” person. I’m not scientifically minded & I am not mathematically proficient. Yet I read the reports generated by the industry (whether for this project or a tritium light facility or a reactor refurbishment or a license extension) & certain things come up again & again. Fancy language & terms are thrown about. Many unsubstantiated claims & predictions are made. Weak language & reassurances predominate. The use of the word “robust” is repeated endlessly – yet the evidence & the studies & the conclusions cited are always anything but robust. Weak & unverifiable claims are made – inevitably & repeatedly – about there being no adverse environmental impacts. It doesn’t matter what the project happens to be. Miraculously, no adverse impacts are ever anticipated! I honestly doubt that most 10-year olds reading these reports would find their concerns for the future of the Earth adequately addressed. Or find the lofty claims being made credible. Overall, it strikes me that nuclear industry people are most concerned about the costs of waste disposal. Not public or environmental safety. The goal is pretty clearly to get rid of the waste as quickly & as cheaply as possible. While earning vast sums of money for the individuals & corporations involved, of course. In fact, earning money (and lots of it) for a large number of engineering firms seems to be perceived as almost a moral imperative within the nuclear industry. That it is absolutely not one for the rest of society is something the nuclear industry needs to begin to grasp. We have created a list of 10 reasons why the DGR should not be approved. Industry people say “Trust us.” But we cannot. How could we possibly?? For most people, it would be unthinkable to poison the drinking water of 40 million people. Or actually, even to contemplate doing so! Nuclear activities have already poisoned bodies of water all over the planet. The industry cannot be permitted to ruin the drinking water of all those who rely on the Great Lakes for their drinking water. “Bury it & run” is not an acceptable basis for the responsible handling of nuclear waste. At the same nuclear waste conference that was such a learning experience for me, Adrian Simper, Strategy & Technology Director for the Nuclear Decommissioning Authority in the UK, spoke about decommissioning activities in Britain. He was upfront about the fact that the so-called nuclear “legacy” there is a major public liability. He also acknowledged that the NDA is spending taxpayers’ money, so it must be done responsibly. He seems to have a firm grasp of the fact that those of us being saddled with all this nuclear waste must be permitted a say in how it is handled. Mr. Simper said several rather memorable things. He spoke of clean-up activities at Dounreay in Scotland, where materials are being “recovered” from shafts & silos. That there are no actual records of what is there. “We don’t quite know what will happen,” he admitted. Durham Nuclear Awareness & many others you are hearing from at this hearing agree that, with this project, the risks are quite clearly intolerable. Nuclear waste must never be abandoned. It must be kept in engineered facilities where it will always be monitored – forever monitored & retrievable, should containment fail. There must be zero tolerance for the escape of radiation from the storage facility. We have no right to impoverish or imperil the lives of our children and grandchildren and all future generations with any increase in exposure to ionizing radiation. Dr. John Gofman, Ph.D & also a medical doctor, in the early days of his career as a scientist helped isolate the world’s first milligram of plutonium for the Manhattan Project. He later became a passionate & vocal dissenter from the nuclear project. He said a great many quotable & brilliant things (& he was not only a brilliant man, but also a funny one). Things don’t go perfectly, do they? This scheme is not any more likely to do so than so many others we could name. And I have just learned evidence in the past 24 hours about some of these other deep geologic repositories that are supposedly great. And they’re not great. They’re not working. We ask that you deny OPG the right to proceed, & insist that they come up with better-thought-out plans for nuclear waste.